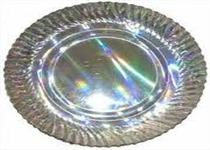 We are manufacturing and selling all types and sizes of paper plates with silver lamination.We supply wholesale & retails.Please also contact for machines inquiry. These are the silver laminated paper plates with white duplex at the back. Paper quality is 300 gsm. I pack consists of 50 Pcs of plates. Ideal for Break fast and Mini meals. Order accepted if the quantity is minimum 10 Packets. Silver laminated patravali or compartmental plates ideal for Lunch & Dinner supported with a white duplex paper. Plate size is 14" with 230 GSM. 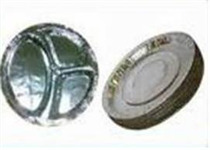 1 pocket consists of 50 Pcs and minimum order should be 10 pockets.